So it’s British Legion Poppy Appeal time once again, when the symbol of the Remembrance Poppy becomes part of the British consciousness. The start of my Legion story began with the invitation from a local theatre group. They asked me to make necklaces for their female cast for their 2014 show ‘It’ll be over by Christmas’. This was a work that poignantly commemorated the centenary of World War I. So the hunt was on for a poppy that I was happy to use in my work. It had to be handmade, striking & would work well with my classically elegant style. After hours of searching I eventually found Derbyshire Polymer Clay Artist Elise Canning. I instantly fell in love with her beautiful work. And so the first Deborah Jayne poppy necklace was born! After their debut on stage, the play in which my husband also made his acting debut, I really wanted to make my own contribution to the Royal British Legion. I was delighted with the response I received from their local fundraising leader, so my fundraising began. Over the past two years I have been really proud to be making & selling this jewellery, & hope 2016 will be another great year. 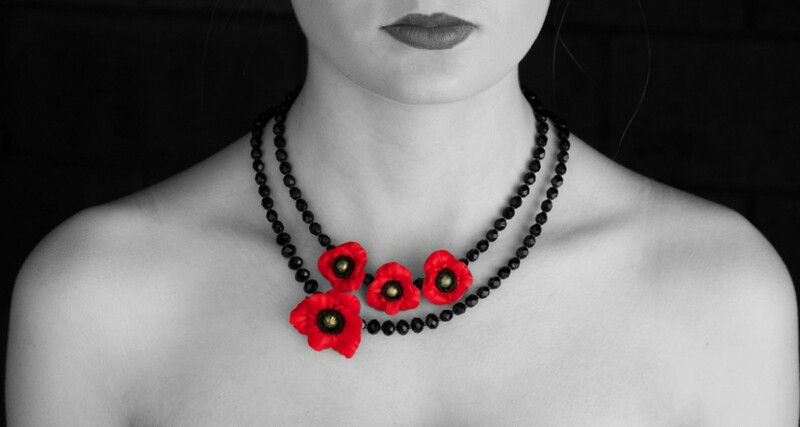 Fresh for 2016 are some beautiful, newly commissioned poppies exclusively for Deborah Jayne. Each of these handcrafted polymer clay mini works of art now have a sparkling green Swarovski crystal to the centre, & the medium poppy is now slightly larger for even more of an impact! This year there will be three poppy sizes to choose from (Small £18/ Medium £22/ Large £25), as well as a limited edition range incorporating triple poppies (prices starting from £26.50). 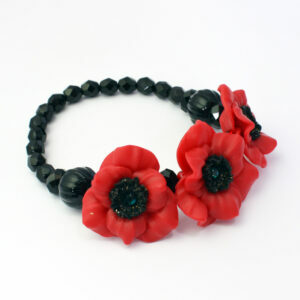 Another new design is my statement bracelet, giving the WOW factor of three large poppies. But for those of you who prefer to be a little more understated I will be continuing my extremely popular poppy charm bracelets. 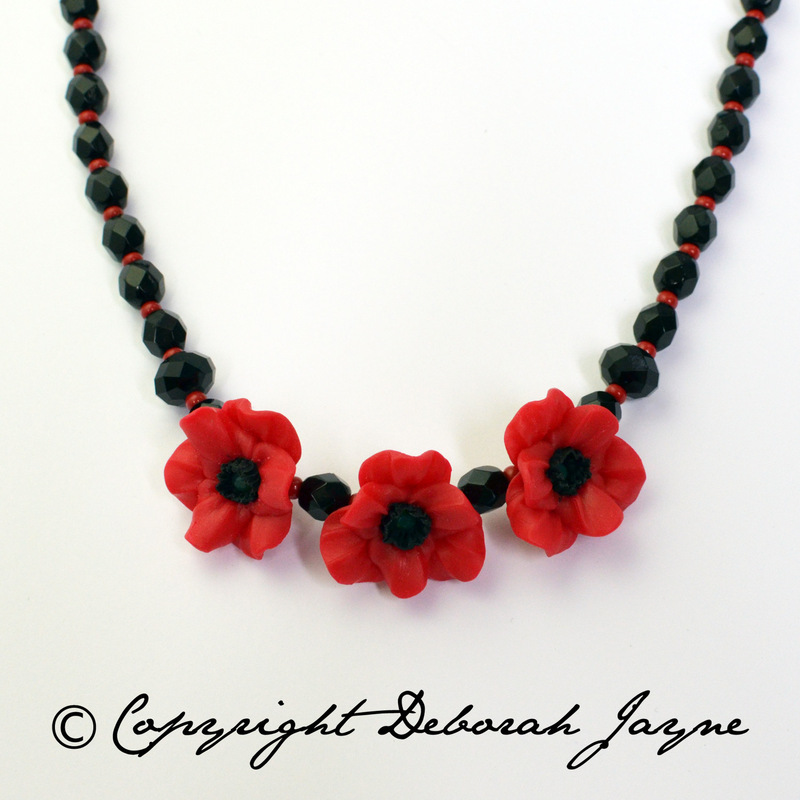 Even more exciting news for my poppy jewellery; this year the Lichfield Cathedral Bookshop will be stocking Deborah Jayne! This means so much to me as the Cathedral is such an iconic symbol of the beautiful city in which I am very lucky to live! This also reinforces my ethos of supporting local small businesses at the same time as supporting the Royal British Legion. 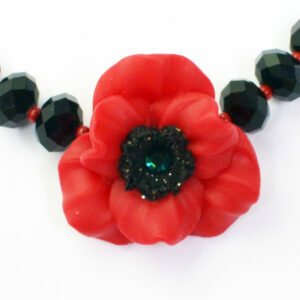 All my poppy range will be available from the Bookshop, as well as from my online Boutique.